The death of Sen. John McCain has elicited an enormous amount of commentary about the differences between the former Navy pilot and POW and the current president of the United States, who received five draft deferments, one of them for "bone spurs," and who once remarked that avoiding getting a sexually transmitted disease was his "personal Vietnam." The two men are also imperfect avatars for a deep ideological divide on the right between what might be called the forces of democracy and the forces of nationalism. And right now the nationalists are winning. Across the world, populist movements discuss nationalism as an old idea that is new again. Nationalists aren't necessarily anti-democratic, but they emphasize a national will rooted in culture or ethnicity, not elections. It's no secret that the president styles himself a nationalist. Skeptical of international institutions or too much hand-wringing about democratic norms, Trump defines national interest in almost autocratic terms. McCain's worldview was, properly speaking, patriotic, not nationalistic, in that it was credal, bound up in democratic principles. Different worldviews yield different approaches. Both could be scathing critics of international institutions and alliances, but Trump's indictments largely revolve around any obligation that impedes his "America first" nostrums, while McCain's focused on threats to democratic values and American leadership. In 2007, for instance, McCain proposed creating a League of Democracies to counter the influence of the United Nations and other organizations that do not really care about democratic values. After all, the U.N.'s admission criteria boil down to mere existence as a nation. The Security Council was created on the principle that might makes right, which is why China and Russia are on it. The various human rights bodies are magnets for autocracies and dictatorships desperate to rig the system in their favor. The General Assembly is democratic solely in the sense that evil dictatorships get an equal vote to enlightened democracies. It would be a fitting response to both the passing of McCain and the rise of nationalism around the globe if the League of Democracies were given a fresh look. Creating a separate body with more selective -- and higher -- standards, McCain argued, "would form the core of an international order of peace based on freedom," providing a counterweight to the axis of autocrats around the world. Nations, like people, respond to incentives. Membership in an organization of shared values would give countries something to strive for beyond boosts to their GDP. The fact that embracing democracy (and a law-based liberal order) yields greater economic growth would be an added inducement. 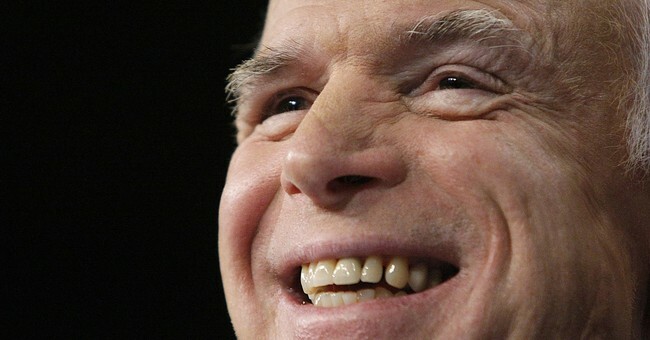 The league wouldn't "supplant the United Nations or other international organizations," according to McCain. "It would complement them. But it would be the one organization where the world's democracies could come together to discuss problems and solutions on the basis of shared principles and a common vision of the future." Right now, ascendant nationalist movements are struggling to find a common vision of their own. The problem is that these movements have no common transnational ideals, save a shared hatred for their rulers or migrants or some other group. McCain's vision of a shared commitment to freedom is the alternative needed now, at home and abroad.